A team of researchers has presented the results of an analysis focused on the internal structure of the Bent Pyramid of pharaoh Sneferu (Snefru), a 4,500-year-old monument named after its sloping upper half. Researchers from Egypt, Japan, Canada, and France have connected their knowledge and experience to work on the Scan Pyramids project. They are using innovative methods to take a look inside four of the ancient pyramids in Egypt without damaging their structures. Now, the picture they have received of the Bent Pyramid is as clear as if they had used an X-ray. The study is based on three modern technologies: infrared thermography, 3D scans with lasers, and cosmic-ray detectors. All of them have allowed the researchers to take better look inside the pyramids. Using the infrared thermography technique, the researchers measured the infrared energy emitted from the structures. The results of their testing were used to estimate the temperature distribution inside. Then, the team used lasers to bounce narrow pulses of light off the interiors of the Bent Pyramid. The last part of the research was locating cosmic particles, muons , within the structure, using detector plates. Muons are formed at the moment when cosmic rays hit the Earth’s atmosphere. The particles rain down from the atmosphere, pass through empty spaces, and they can be absorbed or deflected by harder surfaces. They don't affect the human body, but if special detector plates are used, they can be tracked. Kunihiro Morishima, from the Institute for Advanced Research of Nagoya University, Japan, placed 80 plates in the lower chamber of the Bent pyramid. They covered an area of about 10 square feet (0.93 sq. meters) and stayed there for 40 days. Following an analysis of these plates, the researchers were able to create 3D images of the pyramid, which revealed the shape of all of the chambers inside the pyramid. The Bent pyramid is located in the royal necropolis of Dahsur, 25 miles (40.23 km) from Cairo. It was built during the reign of pharaoh Sneferu, who ruled Egypt c. 2,600 BC for 30 or even 48 years. Sneferu is known as a great builder of the pyramids. He wanted to create the greatest pyramid in the world, and looking for perfection, he created at least three. For many decades, Egyptologists have speculated that Sneferu was buried inside the Bent pyramid in an undiscovered burial chamber. However, the recent research has ruled out this hypothesis. The researchers didn't detect any unknown chamber of a size which could be a burial chamber in their scans. 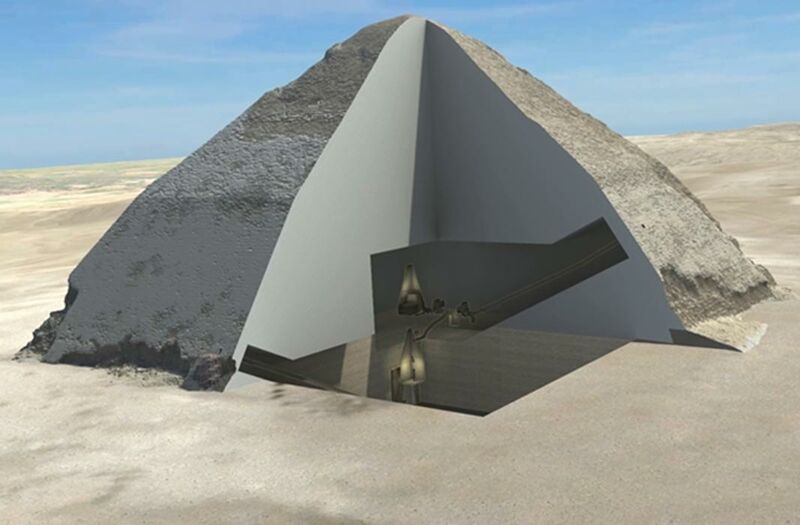 The Scan Pyramids project began in October 2015, and is being carried out by the authority of the Egyptian Ministry of Antiquities, with the support of researchers from Cairo University's Faculty of Engineering and a non-profit organization called Heritage, Innovation, and Preservation (HIP -based in France), with aid from researchers of the Université Laval of Quebec, Canada, and Nagoya University of Japan. Apart from the Bent Pyramid of Sneferu, scans have a focus on the Red Pyramid in Dahshur , Khufu’s Pyramid (also known as the Great pyramid and Cheops), and Khafre’s Pyramid in Giza. On January 18, 2016, Ancient Origins reported the first results of the research - the thermographic scans. According to the information presented during the press conference by Matthieu Klein of Canada’s Laval University, there is no clear separation of temperature on the west side of the Red pyramid. The scans have, however, shown two anomalies located on the northern flank of Khufu's Pyramid. The next steps of the project will be focused on the Great Pyramid of Khufu at Giza. Using two other types of electronic instruments besides the chemical emulsion films from Nagoya University, the researchers will try to analyze the mysterious hidden chambers located in the pyramid. The team is also participating in the project searching for possible hidden chambers in KV62, known as the tomb of Tutankhamun. A thermal anomaly detected on the eastern side of the Great Pyramid, also known as Khufu or Cheops, at the ground level. Credit: Philippe Bourseiller / HIP Institute, Faculty of Engineering, Cairo / Ministry of Antiquities. I anxiously await new issues though I have just signed on. I love history! The more ancient the better! The "Great Pyramid" was not built by the Khu named Fu. That is false. The only image of him as a statue is a miniature, @ 1" tall. That is a Chinese icon....and I won't tell you the rest of the tale.